We offer tutorial workshops (fee charged) on the Saturday following our regular meeting, from September to May, excluding December for our members. For workshop lists from previous years scroll down the page. Members can view details regarding workshops here. Please note that the response for this workshop is overwhelming. As such, it will be offered twice. 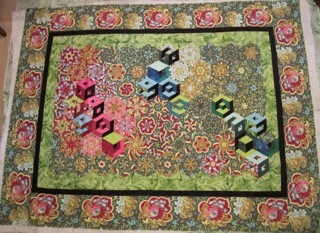 Quilting offers so many options in terms of colour , style and self -expression. Different construction techniques allow us to choose how we can make that dream project a reality. 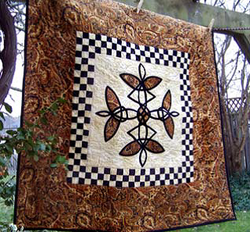 This curved-piecing method is easy to learn and fun to play with. We will learn while making Autumn Leaves , but there will be time to interpret your own design ideas. Venue: South Common Community Centre, 2233 S Millway, Mississauga. Please note that as October 7, 2017 will be Thanksgiving weekend, we have changed the Tuffet Workshop date to December 2, 2017. Please check/mark your calendar. ​Tuffets are back! 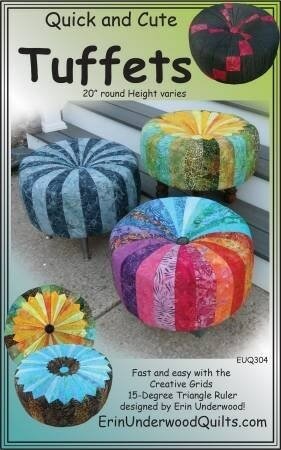 We will use the Quick and Cute Tuffets pattern by Erin Underwood Quilts. However, if you have other tuffet patterns, feel free to use those. Please note this is a one-day workshop with some pre-work. Fees: Workshop - $50; Kit - $75 - this includes 6” legs (see the link below), the leg brackets, a wood base with all the holes predrilled, the foam, the cord, the batting, the button). Are you looking for some focused time to work on a specific project? Are you in need of some advice or help with a pattern or technique? Are you interested in making a postcard for the CQA challenge (see website or November newsletter for more information)? This is a day for you to spend with other quilters on projects of your choice. Heather P has offered to show us how to make postcards and we will have some Tim Tex you can purchase. It would great to share embellishments or fabric scraps. A photo of the fantastic results from the above workshop. This Simply Woven quilt by Jessica Kelly is a modern looking scrap quilt. 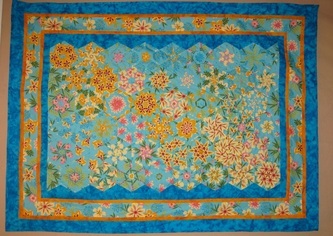 If you can sew a ¼” seam and cut a straight line, you can make this quilt. You will to listen (and read) carefully before you cut and will work your way through a step-by-step process to create blocks which give the appearance of woven strips. 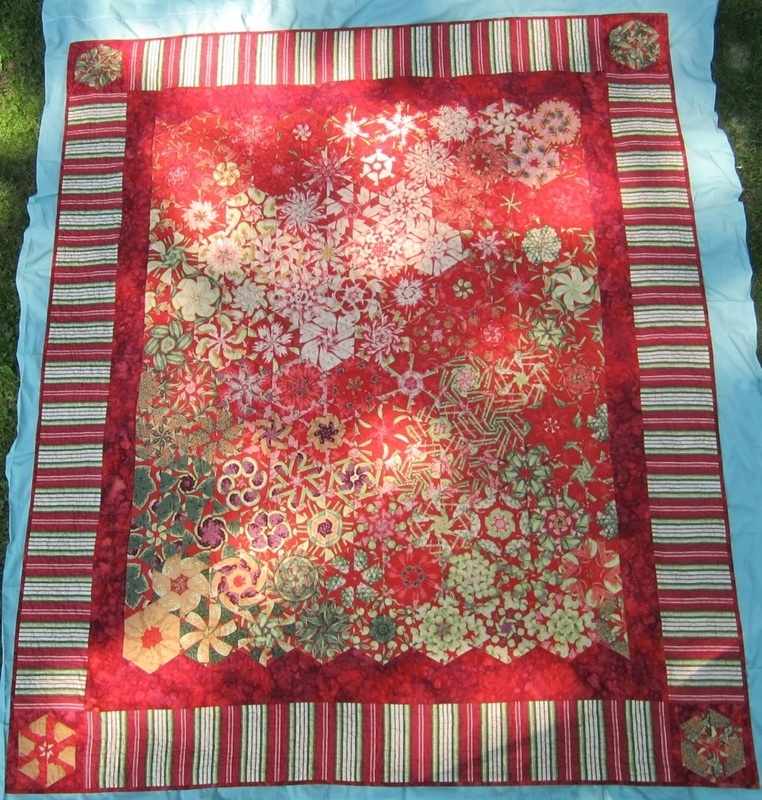 This quilt uses 2½” strips of different lengths. It works well with scraps or a jelly roll and your choice of background fabric. 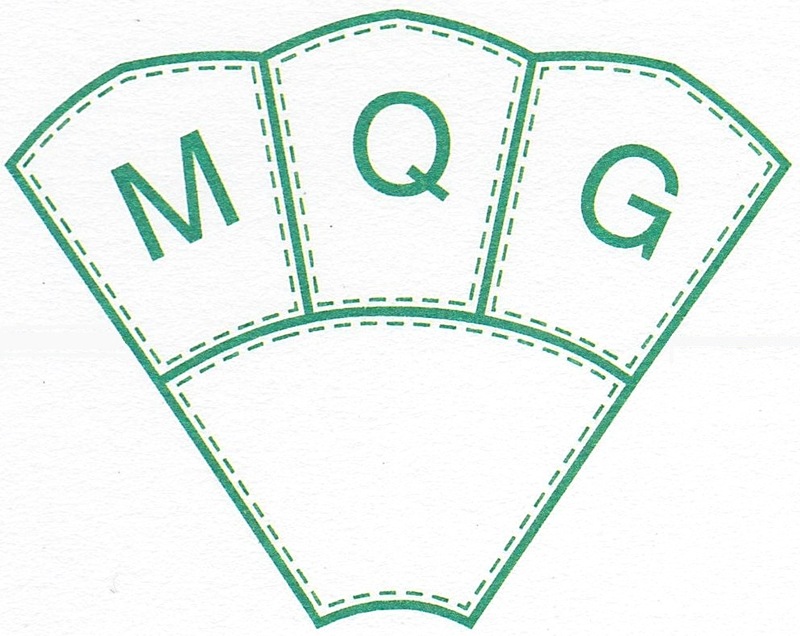 Options for different sized quilts will be included in the materials list. 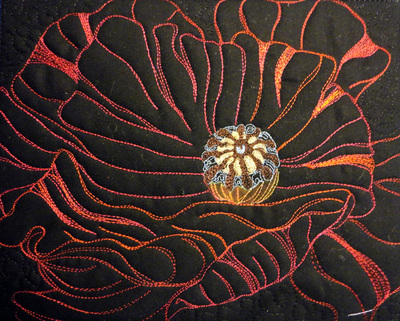 In this innovative and extremely popular class students will create a one of a kind quilted rug using at least 3 and up to 5 layers of fabric, plus a backing and batting. The will work from their personally drawn “doodle” which they will transfer to their rug and using a very unique technique, sew and cut to the desired colours. 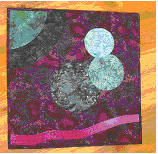 Learn how to make contemporary, original art quilts with irregular, often unplanned shapes, start to finish. Cut and sew effortless, graceful curves, try lots of ways to use wedge shapes and experiment with many varieties of “logs”. You will explore new paths to overall creative design. You will learn several different techniques to produced curves and irregular shapes. Join Joni Newman from Quirks&Quilts for a fun day making these eye-popping flowers. 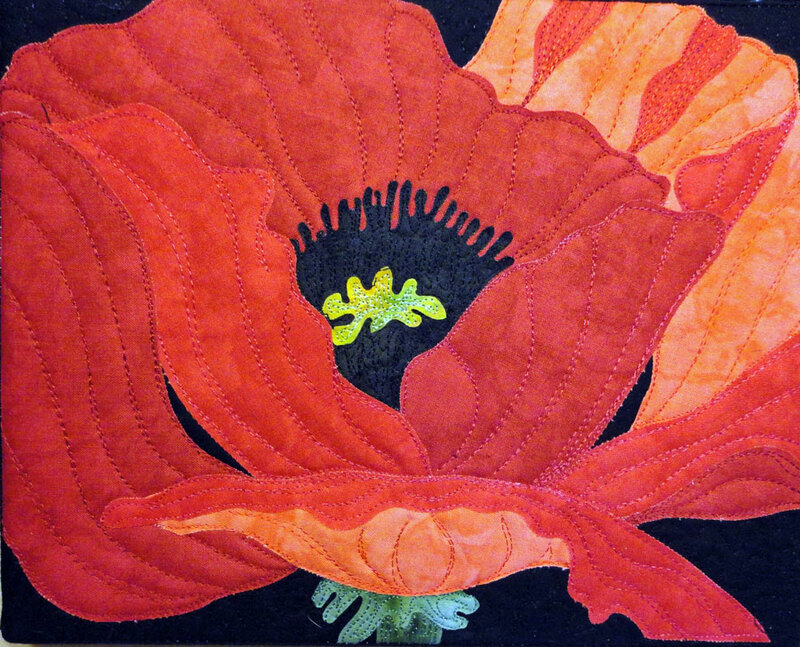 Learn tips for making and embellishing fused, 3D and thread poppy quilts. 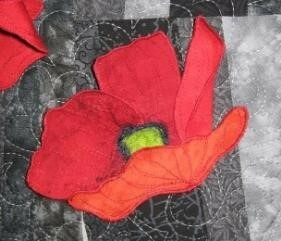 We will spend the morning making 3D poppies suitable for mounting on quilted backgrounds. 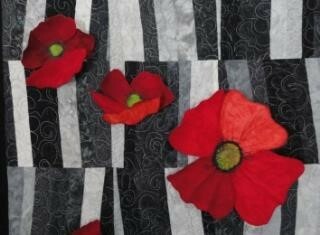 The afternoon will start with a small quilt featuring a raw edge fused poppy and some introductory thread play. 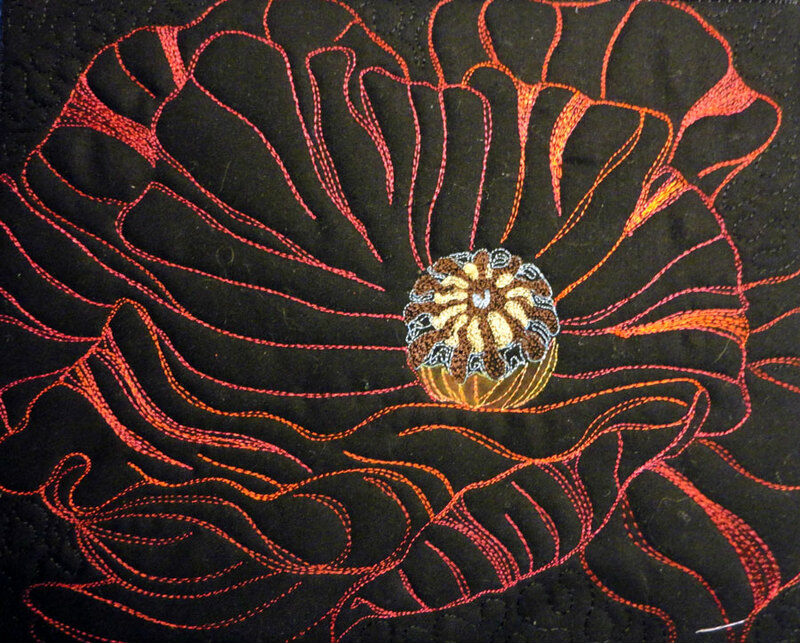 Take the thread play practiced on this project and create a second small quilt with just coloured thread! We’re going to explore various ways of slicing and dicing simple blocks like four patches, nine patches and pinwheels to make some pretty cool quilts. This class is mostly focused on technique – you will make a series of samples of each style. Also, we are going to push these techniques out of the box and explore some “what ifs”….what if we change the size; what if we used striped fabric – well you get the idea! Throw caution to the wind as you select 12 fabrics of your choice for each of the samples. Step out of your comfort zone and have some fun .There are no rigid rules—all types of prints or solids may be used. Stripes, one way designs and large florals are no problems. You will learn how to create a “strata” and then form the traditional bargello pattern by cutting and placing your strips in a specific order. Just be warned---once you have created one wall hanging, the “bargello” in you will be unleashed and could become addictive!!! 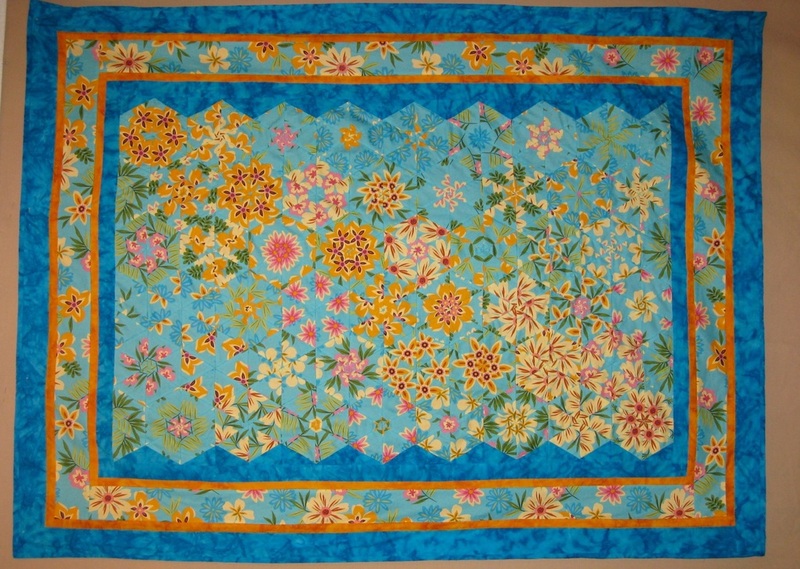 Learn how to make a sensational kaleidoscope quilt from one piece of fabric using Maxine Rosenthal’s method of cutting and piecing in strips. Rotary cut equilateral triangles are used to make unique and beautiful hexagons that produce a flow of colours of the original fabric into a sensational design. Make a wall hanging, a table runner or a bed quilt. This one day class will get your creative juices flowing, you’ll love the result and we’ll have a few laughs along the way. "Stack n' Whack" and "Four Block Posies"
These are the workshops that were offered in 2013-2014. "A Tribute to the Season"